Earlier this year, Twitter had announced that it would be changing its interface to adopt a surface for new types of ads. 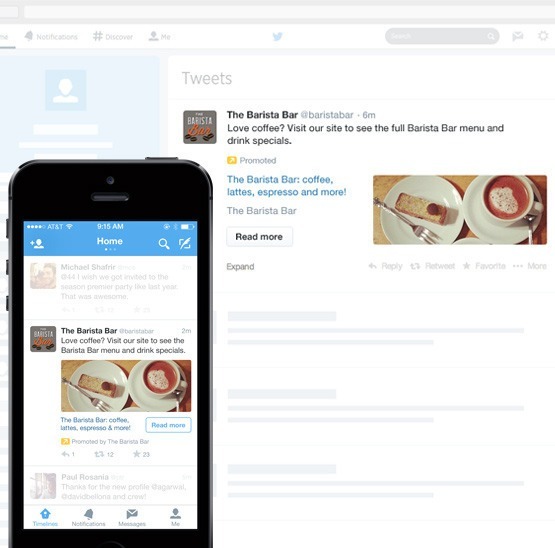 As of Friday, Twitter had announced Website Cards for both desktop and mobile layout. Website Cards essentially is a new ad-unit that highlights a small photo, text and the URL of the advertiser’s webpage. This is in an effort to drive more traffic for advertisers than just pairing an image and URL. I think that if it doesn’t integrate will within in the user’s feed then it’s going to feel somewhat similar to how Facebook displays their ads. If they were able to follow a similar format to Tumblr and have ads that barely are noticed as ad but instead display as regular content then having that seamless flow would appeal much more. And since information on Twitter occurs much more quickly, having a more seamless integration would prove to be more beneficial than appearing as an advertisement. Would have to see the actual ads and how it roll out to see for myself whether I can actually pick up on it. Otherwise, what do you guys think? Would using these Website Cards actually drive more traffic or will it be like how Facebook annoyingly has ads interrupting your news feed? I think it’s a good idea. Twitter has a pretty good track record of using native advertising so I don’t think this new implementation will be disruptive to the user experience. I like the idea of an easy link to a company website. If I’m interested in them I would have looked up their website anyway so making it easier for me just makes it better for the company. It should increase traffic, but companies should make sure they are linking to landing pages if they are going to be integrating it into tweets to generate leads. I would like to see the option to integrate the website cards on the profile so they have a more permanent prominent placement that enhances the profiles of companies.